1813: The Bene Abraham Association was formed in London under the auspices of the London Society for Promoting Christianity Amongst the Jews. 1915: The Hebrew Christian Alliance of America was founded. 1934: First Hebrew Christian Church was founded by the Presbyterian Church (USA) in Chicago. 1967: The six-day war in Israel occurred, resulting in Jerusalem coming under Jewish control. 1973: Jews for Jesus was started by Martin “Moishe” Rosen at the American Board of Missions to the Jews. 1975: The Hebrew Christian Alliance of America was renamed the Messianic Jewish Alliance of America (MJAA). 1979: The Union of Messianic Jewish Congregations (UMJC) was founded. 1986: MJAA formed its association of congrgations, the International Alliance of Messianic Congregations and Synagogues. 1995: Hashivenu core values were created by a group of UMJC rabbis. Most people affiliated with Messianic Jewish congregations view the movement as a restoration of the most authentic form of belief in Jesus, whose earliest followers were Jewish. Contemporary studies, and many Messianic Jewish leaders, trace its more proximate origins to fraternal organizations for Jewish converts to Protestantism in the nineteenth and early twentieth centuries. In the wake of enlightenment, and in service of modern nation-building, many Western European states relaxed laws that effectively (or completely) banned Jews from citizenship. Yet significant restrictions, both legal and, above all, social, still plagued the progress of upwardly mobile Jews. At the same time, new interest in foreign missions swept Anglo-Protestantism and missions to the Jews became a popular cause. These factors resulted in more Jewish conversions in the first half of the nineteenth century, especially among the aspiring bourgeoisie. Some of these early converts in London formed the Bene Abraham Association in 1813, a prayer group that met under the auspices of the London Society for Promoting Christianity Amongst the Jews, an Anglican evangelical mission founded a few years before. Such groups provided inspiration for similar organizations in the United States, notably the Hebrew Christian Alliance of America that was founded in 1915 (Rausch 1983:44-45; Winer 1990:9, 11; Cohn-Sherbok, 2000:16; Feher 1998:43-44). To ensure their complete assimilation, these “Hebrew Christians” were expected to join recognized churches and were often explicitly discouraged from marrying each other or retaining traces of Judaism to ensure their complete assimilation (Winer 1990:10; Harris-Shapiro 1999:21-28). This was the norm into the mid-twentieth century, with a few notable exceptions, such as First Hebrew Christian Church, founded by the Presbyterian Church (USA) in Chicago in 1934 (Ariel 1997). The 1960s incited a series of important changes. Galvanized by the ethnic pride movements among many communities of European-Americans, such as Italians, Irish, and Jews (Feher 1998), some Hebrew Christians began to see value in their “ethnic” heritage. More importantly, an unprecedentedly large number of young Jewish baby boomers became believers in Jesus. Most were drawn to the emotive, charismatic forms of evangelicalism being honed in California among the hippies and “Jesus People” (Eskridge 2013; Dauermann 2017:6-11). These circles newly valued Jews and, to some degree, Judaism in large part due to the surge in premillennial dispensationalism (Winer 1990:46-47). This century-old theology had a profound impact on the evangelical imagination after the 1967 war in Israel when Jerusalem came under Jewish control, which seemed to fulfill biblical prophesies (Luke 21:24). More specifically, dispensationalism argued that Jews as Jews retained a key role in the Messiah’s Second Coming, especially the “remnant” that became followers of Jesus. For many evangelicals, and Hebrew Christians, it seemed like a new phase in the End Times had commenced, in which Jewish heritage believers in Jesus would be central. Other participants in these events have recalled that their pride at “the political autonomy of Jerusalem under Israeli control” encouraged a desire for their own “faith-autonomy” from Christian churches (Juster and Hocken 2004:15). Hebrew Christians began to discuss forming their own congregations (Ariel 2013:214-44; Hocken 2009:97; Harris-Shapiro 1999:24-25). At the same time, the 1960s changed the Christian orientation towards Jewish evangelism. The events in 1967 pushed evangelicals to fund more evangelism, while growing inter-faith dialogue among mainline Christians and Jews pushed the churches that had traditionally supported these missions to withdraw. In the midst of this shift, Jewish heritage believers in Jesus argued they could provide a more effective channel. In conversation with mainline churches, Jewish believers emphasized stable congregations that would respect Jewish culture, rather than missionary societies. In conversation with evangelicals, Jewish believers argued that their insider status offered more innovative and effective evangelism. On both sides, older missions boards provided incubating grounds for the new movement. The best-known example is Jews for Jesus, [Image at right] a missionary organization started in 1973 by a convert and conservative Baptist pastor named Martin “Moishe” Rosen, which grew out of the American Board of Missions to the Jews (Ariel 1999). From the perspective of Messianic Judaism, however, the most important organization that arose out of this period is the Messianic Jewish Alliance of America (MJAA), [Image at right] which is the largest association of its type today. It was created in 1975 by renaming the older Hebrew Christian Alliance of America. This name change was highly significant because the debates that preceded it offer insight into the challenges facing the still small community of Hebrew Christians. In broad terms, it pitted an older generation against the influx of converts who now called themselves Messianic Jews. The latter wanted independent congregations; the former were loath to separate from the Christian institutions that they attended and in which many were ordained and employed. Another issue concerned whether the new movement should adopt popular charismatic Christian practices, through which many of the new generation had come to Jesus (Ariel 2013:220-21; Juster and Hocken 2004:34). In the end, the younger wing won the day, supported by many of the older guard. Evangelical Christians became more aware of the Messianic Jewish movement in the 1980s and 1990s. Messianic Jewish spokespeople regularly wrote in to evangelical magazines to correct gentile coverage of Israel or Judaism; they visited churches to play Jewish music or demonstrate the Passover Seder; they produced media to instruct Christians on evangelizing their Jewish neighbors (Hocken 2009:97, 101; e.g. Rubin 1989). By the mid-1980s, more Christians began to seek out Messianic services. This pattern has grown exponentially since the 1990s, thanks to the Internet. Immigrants from the Caribbean, Africa, Latin America, and elsewhere are another major source of growth today. They come from a host of often-independent charismatic and Pentecostal churches and view themselves as followers of the Jewish bible. A fair number also understand themselves to be Jewish through family descent, personal revelation, or the biblical lost tribes of Israel (Kaell 2017). Earlier estimates put the number of gentiles in Messianic congregations at about fifty percent (e.g. Feher 1998:47-50; Juster and Hocken 2004:10; Dulin 2013:44), sixty percent (Wasserman 2000) or, simply, “more Gentiles than Jews” (Dauermann 2017:14). In my research, I found that Messianic congregational leaders estimated the number was between seventy and eighty percent (see also Dein 2009:84). This number is higher in small, independent congregations. Today, Messianic Judaism is an extremely diverse and fast-growing movement. At a very basic level, Messianic Judaism can be defined simply as those congregations and individuals who bring aspects of Jewish identity, belief, and practice together with the belief that Jesus (Yeshua in Hebrew) is the Messiah (ha Moshiah) promised in the Hebrew Scriptures who came, first, as the suffering redeemer and will return to ignite the End Times. One core tenet across the Messianic spectrum is that salvation comes only through the atoning death of Yeshua. Another is that Jewish people, as well as Jewish biblical texts and rituals, are “fulfilled” or “completed” in Yeshua. It is a clear rejection of “replacement” (supercessionist) theology, a once widespread Christian idea asserting that the Jews abrogated their covenant with God because of their disbelief in Jesus, which then passed to the Christian church. Instead, Messianic Judaism accords a distinct role and theological importance to people with Jewish heritage. The rejection of replacement theology can thus be seen as the central piece in Messianic Jews’ symbolic self-legitimation. It explains why there should be a Messianic Judaism separate from the branches of Christianity into which Jewish converts had so long been incorporated. In practical terms, it means that Messianic Jews reject the idea that a Jewish heritage person converts to Christianity; they become fulfilled through a new awareness of the Messiah that was always theirs. Likewise, Messianics view Jewish texts and the Jewish covenant as “fulfilled” rather than replaced by Yeshua’s coming. They therefore use both the Jewish and Christian scriptures, which they usually call the Tanakh (in accordance with Judaism) and the Brit Hadasha. Because Jewish heritage believers are still considered Jewish, believers in Yeshua fall into two categories in Messianic congregations: “Jewish” and “gentile” (without Jewish heritage). From a Messianic perspective, these believers are the spiritual vanguard that will lead Jewish people back to their “authentic” faith and usher in the prophetic promises of scripture (Warshawsky 2008:3). They often see the other side of their prophetic role as recalling the Christian church to its rightful Jewish roots. Beyond these basic points of agreement, congregations are highly diverse and generally take their basic structure and doctrines from the Christian churches or denominations that support them, planted them, or trained their leaders. As a result, one congregation might be largely indistinguishable from a mainline Baptist church; another will be highly Pentecostal; still others are idiosyncratic. Nevertheless, there are a few widespread beliefs or tendencies. The vast majority of U.S. Messianic Jews believe in humanity’s sinful nature and individual resurrection and judgment, in line with evangelical theology. They also believe God is “triune” (three persons), as per Romans 8:14-17 and Matthew 28:18-20: Father (Abba), Son (HaBen) and Holy Spirit (Ruach HaKodesh). Charismatic or Pentecostal congregations more strongly emphasize the last of these three. Most congregations view the Bible as divinely inspired and its teachings are a final authority in matters of faith. To that end, Messianic Jews pride themselves on providing what they view as a deeper and necessary context to understand the Brit Hadasha through its Jewish origins. Messianic congregants often feel that the evangelical and charismatic churches they attended previously were less cerebral, did not study the Bible as a whole, or offer concrete examples of Judaism in Jesus’ life (Dulin 2013; Kaell 2015). Apocalyptic prophecy is also highly important. Many Messianic congregants are regular consumers of media about the prophetic role of Jews and Israel. They generally support the state of Israel for political and mainly theological reasons, holding the same basic opinions in this regard as the majority of U.S. evangelicals. As I have noted elsewhere (Kaell 2015), many Messianic leaders teach about the prophetic role of the Jews (and Jewish believers in Jesus, in particular) in evangelical churches, online, or through books and TV programs. These teachers may be affiliated with Messianic Jewish associations or independent and they promise that, by plumbing Hebraic roots, they can unlock the mysteries of biblical prophecies related to the End Times. They began to appear more regularly televangelism circuit in the late 1990s and their audience has grown immensely since the mid-2000s. Messianic Jews are most distinguished by the Jewish-like rituals and tendencies they incorporate into worship. Congregations hold services on Saturdays (shabbat), which include songs in Hebrew (usually styled on contemporary Christian music), scriptural readings, and Hebrew blessings (kiddush) over bread and wine. Worship style and content reflects the divisions between charismatics and non-charismatics, as well as Jewish traditionalists and non-traditionalists. For example, more traditionalist congregations incorporate aspects of Hebrew liturgy, such as the Sh’ma and its associated prayers, whereas others may not. 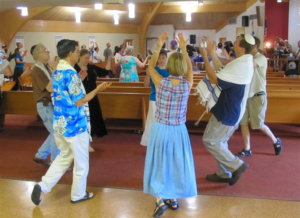 In many congregations, but especially in charismatic ones, the worship is very lively, featuring dancing, shofar-blowing, [Image at right] and upbeat music. Although many leaders frown on glossolalia (speaking in tongues), more charismatic adherents may be slain in the spirit (Harris-Shapiro 1999:10-11) and laying on hands, a classic Pentecostal prayer action, is popular. Congregations with a Torah will process it around the room to be kissed, usually in a festive atmosphere. Services are often followed by oneg (food and fellowship). Congregations include many innovative rituals too, such as blessing children under the chuppah (a canopy used for weddings by Jews) and total immersion baptisms for adult believers. Communion (ingesting bread and wine) is common and is usually celebrated monthly. This act is often viewed as having real and efficacious power, although what this means is generally left undefined. Many congregations have also developed rituals that include the anointing or laying on hands with oil, which is popular among charismatics as a way to convey the healing power of the Holy Spirit (Juster and Hocken 2004:37). Individual worshippers may choose to wear Jewish ritual clothing, usually the tallit (prayer shawl) and kippa (skull cap). In more charismatic settings, (generally male) congregants may blow shofars from the pews. In mainstream Judaism, the ram’s horn is blown before congregants (not by them), is most associated with the high holidays, and forbidden on Shabbat. 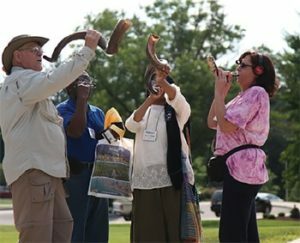 In Messianic contexts, the shofar recalls the horns that will accompany the return of the Messiah, and it is often thought to call down healing angels and blessings during worship. Individuals may also choose to follow aspects of the 613 commandments in the Torah, often related to keeping kosher by limiting foods to those accepted by rabbinical Judaism (a minority of Messianic congregations make kashrut a standard practice and closely follow other Orthodox Jewish norms). Baby boys are circumcised but there is no clarity about male members who believe they have discovered Jewish heritage; men who have not been circumcised may feel personally called to undergo the ritual. Many Messianics (especially of Jewish heritage) celebrate other lifecycle rituals too, including Bar Mitzvah or dedication ceremonies, weddings, and funeral services with elements drawn from Judaism. Music is a foundational practice for Messianic Jews in the United States. Some of the earliest Messianic preaching in California in the 1960s and 1970s was through street musicians. Groups of that era, such as Lamb or Liberated Wailing Wall, are legendary today (and have led to a young generation of Messianic musicians, some of whom are the children of the members of those groups). Messianic music is generally styled on Israeli and klezmer-inflected rhythms, with a strong orientation towards Christian contemporary music. A popular aspect of this musical tradition is Messianic (or “Davidic”) dancing, [Image at right] which is based on Israeli folkdance. It is especially popular among women, although men may certainly be involved. Davidic dancing is performed during Messianic services and taught in classes. Messianic music and dancing have strong followings among non-Messianic evangelical Christians and are popularized through online teaching videos and by travelling Messianic teachers. Holidays allow Messianic Jews to reorient their liturgical and social calendar towards Judaism. Individual believers vary significantly about which holidays they choose to celebrate, both Jewish and gentile. However, most, and perhaps all, congregations incorporate some aspects of Rosh Hashannah, Yom Kippur, Hanukkah, Purim, and Shavuot (Pentecost). The two primary holidays are Sukkot and Passover, which occur in the autumn and spring respectively. Messianics “complete” the Jewish understanding of these holidays by rereading them through Yeshua. Thus Yom Kippur centers on Yeshua and His atonement. Hanukkah celebrates the incarnation of Yeshua and his status as light of the world. The physical deliverance at Purim foreshadows the spiritual deliverance by Yeshua. The Brit Hadasha actually mentions Sukkot (John 7-9) as the time when Yeshua delivered a strongly prophetic teaching in Jerusalem. As a result, many evangelical Christians and Messianic Jews associate the gentile/Jewish joint celebration of Sukkot (especially in Jerusalem) as a sign of the coming End Times. The Passover Seder is the most important and celebrated holiday ritual among Messianic Jews, who have authored numerous instructional guides to that effect. It is often celebrated in Messianic congregations and in Messianic Jewish homes. As with other holidays, the Jewish meaning is completed through Christological significance: the three pieces of matzah signify the Trinity; the blood on the lintel (so Death “passed over” Jewish homes during the plagues in Egypt) signifies the blood on the cross; the Israelites’ physical slavery and freedom foreshadows redemption through Yeshua. Through this lens, Jewish events that predate Yeshua’s coming seem to prove that God’s plan, as Messianics understand it, was predestined from the start. Messianic Judaism is a loose network of evangelistic ministries and congregations. [Image at right] Many congregations are independent, including small storefronts, house churches, and prayer groups; these have yet to be counted or studied in any depth. In my experience, they are more likely to be run by recent immigrants to North America, especially from Africa, the Caribbean, and Latin America. Other congregations in the United States are effectively church plants that receive funding from evangelical parent churches or ministries. Others are self-supporting, or nearly so, and these may range from very small congregations to a handful of large ones with over two hundred members. Many cities in North America have a few Messianic congregations, representing a range of styles and commitments. A few have their own buildings, but most rent the sanctuary space from a church on Saturdays. If they are large enough, congregations host small group activities during the week, usually related to prayer or bible learning. Some congregations encourage door-to-door or street evangelism in Jewish areas, but in my experience the majority do not. All congregations run events, especially for Jewish holidays, during which members are encouraged to reach out to Jewish friends, family, acquaintances, or colleagues and invite them to attend. Congregations may opt for affiliation with a few associations that share resources and create some structure within the movement. The two major ones are the International Alliance of Messianic Congregations and Synagogues (a subsidiary of the MJAA) and the Union of Messianic Jewish Congregations (UMJC). They often work together and each one supports continent-wide events, such as conferences and summer camps. They also certify congregational leaders, usually called rabbis. Smaller organizations for affiliation also exist, such as the Association of Messianic Jewish Congregations and the Federation of Messianic Congregations. The Assemblies of God (Pentecostal) and Southern Baptist Convention have also started their own missionary wings that ordain Messianic Jewish rabbis and support congregations. Evangelistic organizations, such as Jews for Jesus, Chosen People Ministries, and Ariel Ministries, also relate to and support congregations in a variety of ways. Many, and perhaps most, congregational leaders are still trained and often ordained through Christian bible schools and seminaries. In smaller independent congregations, leaders may understand their authority to preach as coming directly from God. Hashivenu, a group created in the mid-1990s by UMJC rabbis, also issues theological statements and runs a website and the Messianic Jewish Theological Institute. It has sparked significant debate among certain Jewish-heritage leaders in the movement, as noted below. In general, Messianic Judaism is highly patriarchal. Men are ordained pastors and viewed as the movement’s most authoritative teachers, theologians, and leaders. There is also strong preference for Jewish-heritage people in positions of leadership, as congregational leaders, authors, speakers, or teachers. At the national level, they are largely of Ashkenazi (European) descent and still include many of the early leaders in the movement and their children. In unaffiliated and smaller congregations, there are more leaders among recent immigrants and people of color, a fair number of whom may view themselves as having Jewish heritage. Turning to the pews, there are often fewer young families in Messianic congregations than in evangelical churches. My research, along with recent studies of U.S. and U.K. congregations (Dulin 2013; Dein 2009), suggests that nearly all congregants, including those of Jewish heritage, come to the movement as adults through churches. Over the last decade or so, some Messianic congregations have begun to present themselves as good places for Christian-Jewish interfaith families. Whether they will succeed in drawing a large number of such families remains to be seen. Most research also indicates that women account for about sixty percent of congregants (which is the norm in U.S. Christianity), and my sense is that there are much higher numbers of people of color, including African Americans in cities like Atlanta, than are normally acknowledged. More systematic research is needed in this regard. Pinpointing the organization of Messianic Judaism is complicated by its diffuse nature. It has a wide impact online among (largely non-Jewish) people who tune in to worship services or Messianic bible classes remotely. I have found that many congregants are still “spiritual seekers” in the sense that they may attend churches at the same time and affiliate loosely, for longer or shorter periods (Kaell 2014; Feher 1998). This poses a challenge for leaders who try to create self-sustaining, close-knit communities. Messianic Judaism also overlaps significantly with trends sometimes called “philosemitism,” “Jewish affinity” or “Hebraic roots” (Sandmel 2010; Karp and Sutcliffe 2011). While each of these terms has different connotations, it is sufficient to define them as a general shift among Christians towards positive feelings about Jews (or biblical Israelites), which leads to the adoption and adaption of Jewish rituals. For example, a Pentecostal church might introduce choreographed dances based on their understanding of biblical Jewish movements, instruments, and clothing. Another church might invite a Messianic Jewish rabbi to wrap their pastor in a Torah scroll, a ritual that routinely draws Jewish condemnation, if reported in the media. Another church might incorporate Messianic Jewish-produced literature into bible study classes or a Seder. All forms of “affinity” have burgeoned since the 1990s, which U.S. Messianic Jews often encourage and other times condemn. While leaders in the MJAA and UMJC attempt to delineate their own movement from others, and clarify which Messianic congregants are acceptable or not, in reality the people drawn to Messianic Judaism are flexible in their commitments, creative, and multivocal. While Messianic Judaism is clearly growing, these characteristics make estimates of the number of U.S. people who attend on any given Saturday nearly impossible to ascertain from current studies. Estimates range widely from 30,000 to 2,000,000, with most hovering at about 150,000 to 300,000. Such numbers may or may not include gentiles and certainly do not include people who affiliate sporadically or online. They also leave out perhaps hundreds of congregations that claim Hebraic roots in ways that do not accord with the Messianic Jewish leadership’s understanding of the movement. For scholars, Messianic Judaism is both interesting, and a challenge, in how it defies seemingly clear-cut religious boundaries. As a result, they tend to be interested in debating whether Messianic Judaism is a form of syncretism, hybridity, or bricolage, based on the definition of these terms in the field of religious studies and sociology. For Messianic Jews themselves, as well as Jews and some Christians, the most definitive issue relates to who is included or excluded as a Jew. This question operates on a few levels simultaneously. In terms of the movement writ-large, Jewish people quite uniformly reject Messianic Judaism as a branch of Judaism (Shapiro 2012), with a few notable exceptions, such as Reform Rabbi Dan Cohn-Sherbok who calls for a “pluralistic model” of Judaism (2000:212). This stance among Jews may shift in the future and Messianic Jewish apologists sometimes argue that it is already changing, it is different in Israel, or polling data is misleading. From the perspective of Messianic Jews, it is clear that people of Jewish heritage are Jews (completed and fulfilled), and many Messianic leaders push for some level of inclusion or recognition from (non-Messanic) Jewish people. Normally, Messianic leaders take two positions: they argue, first, that “Rabbinical Judaism” was merely one, even marginal, movement within Judaism in the Roman Empire and thus the Jewish followers of Jesus are just as legitimate a predecessor of contemporary Judaism; and second, that if Jews consider people who practice Eastern traditions or are atheists as Jewish, then they should not deny this status to followers of Yeshua. For Messianic Jewish leaders, there have been two important bellweathers of their acceptance as Jews over the years. The first concerned the Israeli state’s “Law of Return.” In 1989, the Israeli Supreme Court ruled that Messianic Jews were not eligible for citizenship on the basis of being Jewish since they had voluntarily taken on another religion. However, in 2008, it ruled that because citizenship is granted to anyone with one Jewish grandparent, Messianic Jews could qualify, which is a major coup for those from recognized Jewish backgrounds. The second challenge relates to interfaith dialogue. Messianic Jewish leaders often believe they should be included as “the most crucial missing factor in the Jewish-Christian dialogue” (Kinbar 2001:32-33) because they combine elements from both faiths and thus embody their potential unity. Most liberal/mainline Christian and Jews disagree since they do not view Messianic Jews as representing either side of this dialogue. Further, since the 1960s, Jews and their liberal dialogue partners have eschewed evangelism as disrespectful and destructive of Judaism. Messianic Jews reject this idea and, especially those of Jewish heritage, argue that spreading the Gospel is a form of love, care, and preservation of Judaism within the ultimate reality of Yeshua. This notion is alien, and thus highly confusing, to Jewish observers of the movement. Evangelicals have been most receptive to viewing Messianic Jews as fully Jewish, although even in this camp there is some debate about how and whether to include them in ‘interfaith’ dialogue. Messianic Jewish leaders and theologians who make the argument that they are fully Jewish are, by and large, people of undisputed (usually Ashkenazi) Jewish descent. At another level is the internal challenge about who to include as a Jew within congregations. This is perhaps the thorniest problem facing the movement as it expands through more gentile involvement. Gentiles make up the majority in the pews and largely keep congregations financially afloat, yet a number of scholars point out that their status can be “described as that of second-class” (Power 2011:45; Feher 1998; Harris-Shapiro 1999:71). What these studies mean is that Jewish-heritage people are leaders at a national level and are strongly favored as leaders in congregations affiliated with an association (MJAA, UMJC, and such). While more congregations promote the parity between gentile and Jewish believers on their websites, the latter are still more valuable: a congregation is accorded a greater degree of authority and authenticity the more Jewish-heritage members it attracts; the opposite is true of gentiles. A further challenge lies in the very definition of a Jew, since there is no standard across congregations. Someone who was raised Jewish or had one Jewish grandparent is always included. Gentiles who have married people in these categories also generally count. Many people also feel called to a Messianic congregation and then understand themselves as having discovered Jewish heritage, usually a number of generations back; these may also be included, but only if their stories of self conform to certain norms (Kaell 2016). However, the MJAA and other associations refuse the claims of gentiles who understand themselves to be descendants of the biblical Lost Tribes or Ephraim and Menasseh, and have issued strong condemnations in this regard. They are also highly wary of claims to Hebraic roots and try to suppress these popular theologies within the movement, which they view as a form of supercessionism that makes gentiles into Jews and thereby replaces them. At a larger level, these controversies relate to who gets to define what constitutes “Messianic Judaism”: the people who started its primary institutions or those who flock to it today. A related challenge concerns Torah observance. Messianic Jews believe that salvation comes through Yeshua’s saving grace, and that grace supercedes Torah “law” (2 Cor 3:7). Yet Messianic Judaism also reinstates aspects of those rituals and rules derived from the 613 commandment of the Torah, even as most Messianics see themselves as following “biblical” Judaism and often hold very negative views about what they call “rabbinic” Judaism. As a result, the reasons for following Torah are ill defined at a theological level, and it is usually viewed in vague terms as offering some sacramental benefit or sanctification (rather than “saving” grace). Further, there is no agreement about which practices should be adhered to and whether members considered as gentiles should be expected, or even allowed, to do so as well (Kaell 2016). More charismatic/Pentecostal congregations also tend to innovate many ‘biblical’ rituals, while more traditionalist ones urge adherence to contemporary Jewish norms, for example with regard to rabbinical rules related to kashrut or the Sabbath that structure observant Jewish life. Ultimately, individuals tend to creatively adapt Torah observance in consultation with their congregations, online resources, and (often) the Holy Spirit. Another point of contention concerns whether gentiles can convert, as they can in mainstream Judaism. For the Messianic Jewish leadership in the MJAA and UMJC, this has traditionally been viewed as impossible since a gentile cannot adopt what they view as an inalienable Jewish lineage. However, over the last two decades, a new stream has emerged from the UMJC, catalyzed by the publication of UMJC rabbi Mark Kinzer’s book Postmissionary Messianic Judaism (2005). Hashivenu, as it is called, is still marginal; however its promoters (mainly Jewish-heritage men of status in the movement) provocatively argue that a “mature” Messianic Judaism should move beyond evangelism, promote a Torah-observant lifestyle, and be fully Jewish, in part by allowing gentile conversions. This group has created the Messianic Jewish Theological Institute and Messianic Jewish Rabbinical Council to spread these tenets and confer conversions. In this view, Messianic Judaism confirms the church’s “identity as a multinational extension of the people of Israel” (Kinzer 2005:15; Reason 2005; Power 2011 82-84; Dauermann 2017:11-17). This stance is rejected by many Messianic leaders and Christian pastors. A final challenge (and opportunity) relates to the connections between the United States and congregations elsewhere. The U.S. movement has been the engine driving contemporary Messianic Judaism, in large part due to the country’s robust and well-funded evangelical Christian community. The U.S. leadership acknowledges and has supported the few congregations that have been established in the U.K., Russia, and a handful of places in Western Europe. Of course, Israel holds significant symbolic importance, and U.S. Messianic missionaries have also founded and/or funded many of that country’s congregations. While financial ties still bind, Israeli Messianics are increasingly likely to point out that the movement has developed differently in that context and are carving out much more autonomy. Further, and just as importantly, Jewish affinity congregations are now growing globally (Parfitt and Semi 2002), including in Brazil (Lehmann 2013; Carpenedo 2017), Europe (Gonzalez 2014), Papua New Guinea (Handman 2011; O’Neil 2013) and elsewhere. U.S. Messianic Jewish missionaries have sometimes planted or encouraged these churches (Handman 2011; Gonzalez 2014:126-28), and others have developed out of Seventh-day Adventism, British Israelism, and other theological variants. Most others arise from a variety of dynamics internal to evangelical and Pentecostal congregations outside of the West, which have led them to view themselves as genealogically Jewish or Israelite. Whatever the case, Messianic Judaism in the U.S. will have to contend with this growing movement outside its traditionally defined borders of the West and Israel, as an influx of immigrants joins and founds congregations on U.S. soil. 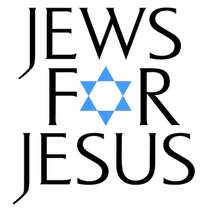 Image #1: Jews for Jesus logo. 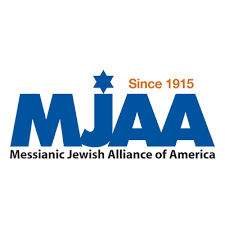 Image #2: Messianic Jewish Alliance of America logo. Image #5: Messianic Judaism logo. Ariel, Yaakov. 2013. An Unusual Relationship: Evangelical Christians and Jews. New York: New York University Press. Ariel, Yaakov. 1999. “Counterculture and Mission: Jews for Jesus and the Vietnam Era Missionary Campaigns, 1970-1975.” Religion and American Culture 9:233-57. Ariel, Yaakov. 1997. “Eschatology, Evangelism, and Dialogue: The Presbyterian Mission to the Jews, 1920—1960.” The Journal of Presbyterian History 75:29-41. Carpenedo, Manoela. 2017. “Collective Memory in the Making of Religious Change: The case of ‘Emerging Jews’ Followers of Jesus.” Religion 48:83-104. Cohn-Sherbok, Dan. 2000. Messianic Judaism. London: Cassell. Dauermann, Stuart. 2017. Converging Destinies: Jews, Christians, and the Mission of God. Eugene, OR: Cascade Books. Dein, Simon. 2009. “Becoming A Fulfilled Jew. An Ethnographic Study Of A British. Messianic Jewish Congregation.” Nova Religio: The Journal of Alternative and Emergent Religions 12:77-101. Dulin, John. 2013. “Messianic Judaism as a Mode of Christian Authenticity: Exploring the Grammar of Authenticity Through Ethnography of a Contested Identity.” Anthropos 108:33–51. Eskridge, Larry. 2013. God’s Forever Family: The Jesus People Movement in America. New York: Oxford University Press. Feher, Shoshanah.1998. Passing Over Easter: Constructing the Boundaries of Messianic Judaism. Lanham, MD: AltaMira Press. Gonzalez, Philippe. 2014. Que ton règne vienne. Geneva: Labor et Fides. Handman, Courtney. 2011. “Ideologies of Intimacy and Distance: Israelite Genealogies in Guhu-Samane Christian Commitment.” Anthropological Quarterly 84:655-77. Harris-Shapiro, Carol. 1999. Messianic Judaism: A Rabbi’s Journey through Religious Change in America. Boston, MA: Beacon Press. Hocken, Peter. 2009. Challenges of the Pentecostal, Charismatic and Messianic Jewish Movements: The Tensions of the Spirit. Abingdon: Ashgate. Imhoff, Sarah and Hillary Kaell. 2017. “Lineage Matters: DNA, Race, and Gene Talk in Judaism and Messianic Judaism.” Religion and American Culture 2:95-127. Juster, Daniel and Peter Hocken. 2004. The Messianic Jewish Movement: An Introduction. Ventura, CA: Toward Jerusalem Council II. Accessed from http://www.messianicjewishonline.com/essays.html on 20 February 2019. Kaell, Hillary. 2016. “Under the Law of God: Mimetic Discipleship and Obligation among Christians Living Jewishly.” Journal of the Royal Anthropological Institute 22:496–515. Kaell, Hillary. 2015. “Born-again Seeking: Explaining the Gentile Majority in Messianic Judaism.” Religion 45:42-65. Karp, Jonathan and Adam Sutcliffe, eds. 2011. Philosemitism in History. Cambridge, U.K.: Cambridge University Press. Kinbar, Carl. 2001. “Missing Factors in Jewish-Christian Dialogue,” The Princeton Theological Review 8:30-37. Kinzer, Mark. 2005. Postmissionary Messianic Judaism: Redefining Christian Engagement with the Jewish People. Grand Rapids, MI: Brazos Press. Lehmann, David. 2013. “Messianic Jews and ‘Judaizing’ Christians – notes from Brazil and Israel.” Unpublished Paper. Accessed from http://www.davidlehmann.org/adlehmann/2014/01/22/271/ on 20 February 2019. O’Neil, Deborah. 2013. “Searching for Identity in Papua New Guinea and the Past.” FIU Magazine. Accessed from http://news.fiu.edu/2013/11/the-lost-tribe-tudor-parfitt-searches-for-identity-in-papua-new-guinea-and-the-past/68135 on 20 February 2019. Parfitt, Tudor and Emanuela Semi, eds. 2002. Judaising Movements: Studies in the Margins of Judaism. London: Routledge. Power, Patricia. 2011. “Blurring the Boundaries: American Messianic Jews and Gentiles.” Nova Religio: The Journal of Alternative and Emergent Religions 15:69–91. Rausch, David. 1983. “Emergence of Messianic Judaism in recent American History,” Christian Scholar’s Review 12:37-52. Reason, Gabriela. 2005. “Competing Trends In Messianic Judaism: The Debate Over Evangelicalism.” Kesher 18: n.p. Accessed from http://www.kesherjournal.com/index.php?option=com_content&view=article&id=51&Itemid=422 on 20 February 2019. Rubin, Barry. 1989. You Bring the Bagels, I’ll Bring the Gospel: Sharing the Messiah with Your Jewish Neighbor. Clarkesville, MD: Messianic Jewish Publishers. Sandmel, David. 2010. “‘Philosemitism’ and ‘Judaizing’ in the Contemporary Church.” Pp. 405–20 in Transforming Relations: Essays on Jews and Christians Throughout History, edited by F.T. Harkins and J. Van Engen. South Bend, IN: University of Notre Dame Press. Shapiro, Faydra. 2012. “Jesus for Jews: The Unique Problem of Messianic Judaism.” Journal of Religion and Society 14:1-17. Warshawsky, Keri Zelson. 2008. “Returning To Their Own Borders: A Social Anthropological Study of Contemporary Messianic Jewish Identity in Israel.” PhD Dissertation, Hebrew University of Jerusalem. Wasserman, Jeffrey S. 2000. Messianic Jewish Congregations: Who Sold This Business to the Gentiles? Washington, DC: University Press of America. Winer, Robert. 1990. The Calling: The History of the Messianic Jewish Alliance of America, 1915-1990. Pennsylvania: MJAA.